Gerald Busby. Courtesy of the artist. Gerald Busby (deep breath!) made his professional debut as a pianist at 15; toured the Southwest with evangelist Angel Martinez; studied under Charles Laughton, Burgess Meredith, and Frank Lloyd Wright at Baylor University; entered Yale Music School on a full scholarship, transferring his major to philosophy, then traveled as a textbook salesman; made his New York debut at Town Hall, becoming Virgil Thomson’s protégé and composing scores for Paul Taylor ( Runes ), Robert Altman ( 3 Women ), Speculum Musicae, the Gregg Smith Singers, and countless others; he has received Guggenheim, NEA, and Rockefeller grants; served as the chef at the Empire Diner; and appeared as Rev. Rutledge in the movie A Wedding . He writes every day, and his works include Body Ode for Three Singers and Glass Eater; Saxorgan for Soprano Saxophone and Pipe Organ; Dance of the T. Rex for Solo Timpani; Sleepsong for Naked Tenor and Two Bassoons; Parallel for Harpsichord and Gymnast on Parallel Bars; Paloduro for Symphonic Band; Encore for Solo Accordion; Clothing Quartet for Piano, Clarinet, Handsome Man, and Beautiful Woman Changing Clothes on Stage. In addition to our two operas, Orpheus in Love and Breedlove , he has set the work of Mark Doty, James Purdy, Jean Arp, Brad Gooch, and William Hoffman. His gorgeous Whitman setting, Behold This Swarthy Face , has been recorded by Thomas Hampson and Craig Rutenberg. May he long continue composing and playing, disregarding cant and fashion while nurturing his loving circle of colleagues and friends, teaching us by his unmatched example how to live joyously and virtuously (exhale!). One way to understand the work of Erik Satie is to imagine a place somewhere between two opposite artistic poles: James McNeill Whistler and Robert Filliou. Filmmaking as a collective project. 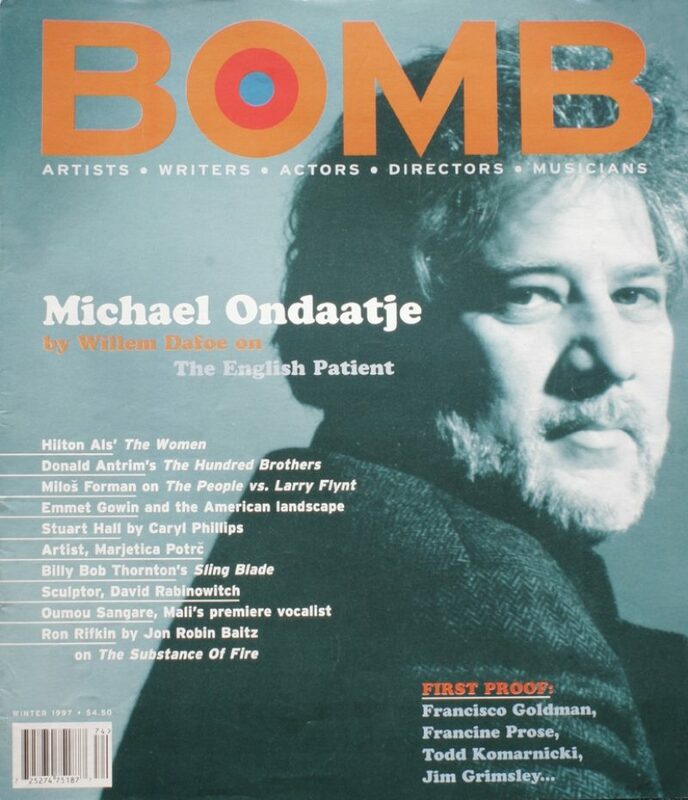 Featuring interviews with Michael Ondaatje, Billy Bob Thornton, Hilton Als, Oumou Sangare, Emmet Gowin, Donald Antrim, Stuart Hall, Marjetica Portč, Miloš Foreman, and David Rabinowitch.